I submitted this piece to a website recently and it got rejected. I planned on just relegating it to the trash bin but then I thought, no. I worked on this, maybe it wasn’t good enough for that website but I took time and effort to write it. Not everything I write is going to be amazing and I need to realize that others aren’t going to appreciate what I write as much as I am because they aren’t looking at it from a personal perspective. I had an epiphany this summer after getting rejected by the book deal. Oh and to clarify, that wasn’t my first ever rejection, I had been turned down MANY times before then. So anyway, I had this epiphany after the book deal that I need to look at rejection differently than I was before. First, I am not taking it as hard. I realize now that it is part of my journey, my story and it is okay. Of course, it does but does it define who I am? But this is where it gets really awesome. I am going to share all of my rejections with you. Because this is where I want my children to someday see them. Because when they read this blog someday, I want them to know that rejection doesn’t mean failure. That when you get knocked down, you can get back up. Just because they say no doesn’t mean that it isn’t necessarily good. It just means that it isn’t their cup of tea. Someone’s no might be someone else’s yes. This is not my best work. But it isn’t my worst. You know what I am getting tired of? To kids of the future. To kids of the past. From his ex-wife’s girlfriend’s, aunt’s, nephew’s, daughter’s, neighbor’s, son who sat next to you in Home Economics. To the lady who treated me like crap on the bus but won’t read this blog post so I am making ALL OF YOU READ IT. We are a generation of blurters. Trust me, I am a blogger, I know. I feel the need to get it out daily. I blurt out crap all the damn time but usually, it is me talking about my crap. I don’t feel the need to write a letter to other people about their crap. Recently, I had kind of had it with these open letters. And I blame Huffington Post for this. I feel like the inventor of the 20 REASONS YOU NEED A DOG BEFORE LABOR DAY is also the inventor of the “open letter” and I wasn’t wrong. 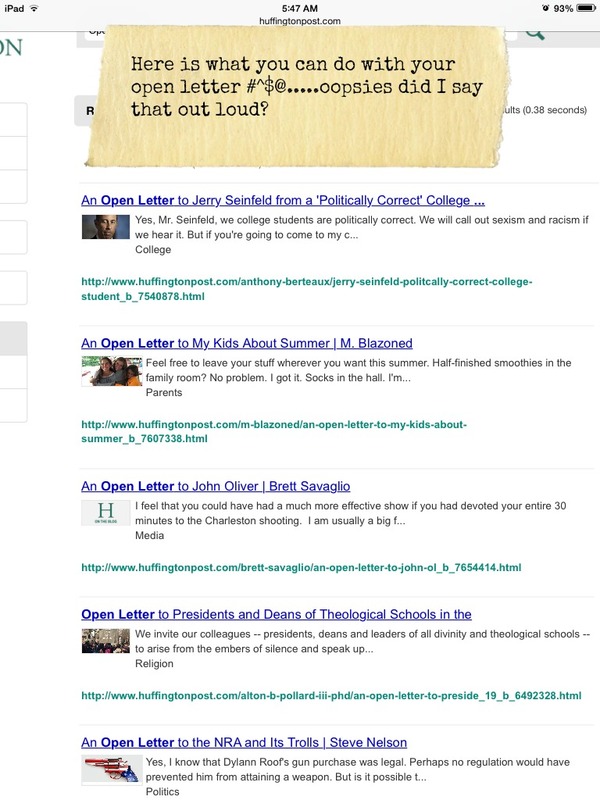 On the search engine of Huffington Post alone, I found 330,000 posts with the search OPEN LETTER. Maybe the authors of these “open letters” should stop writing “open letters” to everyone on the planet and start writing one to, oh I don’t know, say ……..Grandma? When is the last time she heard from you anyway?? I mean, she knitted you that adorable sweater back in third grade and made you those sugar cookies you loved. And they weren’t easy to make. And the best you can do is write letters about how you were given the side eye on the # 3 bus last Tuesday? You can’t give your flesh and blood the time of day but you have PLENTY to say to the person who didn’t give you the service you felt you deserved at the Publix on Sycamore Street? And just like that I probably offended the Grandma-less. I bet I get an “open letter” about that. Or that I wrote about Grandma’s making sweaters and cookies. Because that is a stereotype. Not ALL Grandma’s do that. I bet I get an “open letter” about that too. Look, I am all for getting it out in the open and hashing it out but can we call it something other than an “open letter”? Because when you are writing a letter, you are writing it TO that person. Writing a blog post or article then posting it on a page is not a letter. An “open article” or an “open post”. So let’s rename it, shall we? It is all how you look at things. Maybe the next time I want to get my obsession with Bruce Hornsby’s attention in a blog post, I should title it “scud missile”. Or put that on the front of the envelope in an actual real open letter. Yeah, that should get someone’s attention.